Earlier this year, on the second floor of Wilfrid Laurier University’s science building, a new lab opened its doors to address a growing need on Laurier’s Waterloo campus. In the far corner of the tidy space sits an Oscilloscope. The shelving unit beside it holds countless hand tools. Along the walls are a drill press, new 3D printer, vacuum former (that was built in-house), and the future home of a laser cutter. A hyper-powerful computer hums in an opposite corner, running Adobe and Dassault Systemes design software. “We have a startling array of building capabilities — with creative thinking and these tools you can make just about anything,” says Ron Daniels, Laurier LaunchPad mentor and the Faculty of Science’s entrepreneurship program coordinator. Daniels oversees the LaunchPad Science Maker Lab, which opened this past March and is run through the Faculty of Science. The lab is open to students in any of the entrepreneurial courses at Laurier — be it science, business, music or social entrepreneurship. 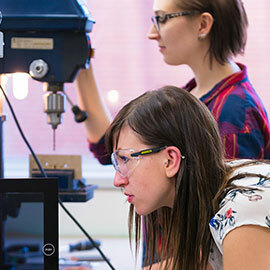 For Olga Dementev, a third-year Laurier business student, her project would be at square zero without the lab and Daniels’ guidance. Last year, she participated in Laurier’s IKEA Sustainability Challenge, which her group won thanks to an innovative idea to break down furniture into a recycled filament for 3D printers. After the competition, Dementev had the chance to work with IKEA to further the project — and was encouraged by the university to work with Daniels and the LaunchPad Science Maker Lab to explore the idea. “At the same time I was starting to work with the LaunchPad Science Maker Lab, one of my mentors and professors at Laurier, Laura Allan, really encouraged me to become involved with Enactus and suggested that I use the sustainable filament project for social change, not just profit,” says Dementev. Now, she is leading a team as project manager under the auspices of Enactus Laurier, a co-curricular opportunity that engages Laurier students in entrepreneurial community-development projects through programs and competitions. Dementev and her group are conducting a series of density tests — very low-tech and affordable approaches to solving a global sustainability problem. Her group is among 12 that are signed up for the LaunchPad Science Maker Lab. A few more groups are in the process of signing up and are at various levels of engagement. For Daniels, his role in the lab is ideal, with feet in both the science and entrepreneurial sides of product development. With an undergraduate degree in chemistry, his career morphed into process engineering prior to going back to school to earn an MBA focused on marketing and entrepreneurship from Laurier. His former business in radio-controlled aviation products was something that grew out of a hobby. “I started to really enjoy the challenge: how could I incorporate customer feedback into my product, and how could I market to people in distant countries at a price point where my cost of sales didn’t exceed my profits?” he says. Daniels ended up selling in 15 countries and fell in love with the entrepreneurship process. “At the lab, I’m available as a technical resource and as a business plan development mentor — but I will gladly defer and refer whenever more specialized expertise is needed,” says Daniels. In addition to his expertise, there are mentors working with other groups in the lab, including an electronics expert and an expert in plastics recycling. To apply to the LaunchPad Science Maker Lab, students must prepare a business model canvas, a simple project plan and a timeline device, such as a Gantt chart. The lab has template documents to get started and Daniels can provide guidance on the application of these tools to projects.